내가 PDA폰에서 설치해 사용하는 주요 소프트웨어 중 하나로, 기능적인 MP3와 WMA 플레이어인 S2P v0.50 버전이 8월 15일자로 출시되었다. - added 2 control buttons in the Album View. 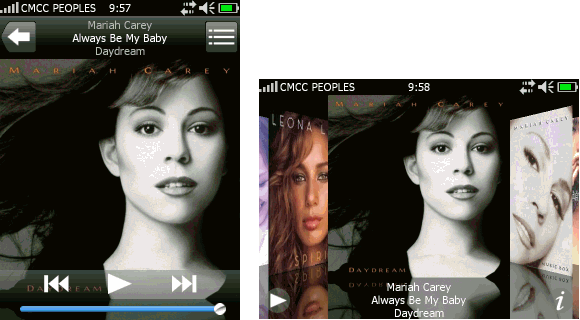 - added option (FastAlbumPic) to retrieve embedded album pic faster (same as v0.38); but if the album pic cannot be loaded probably, disable this option.- changed option AlwaysLoadAlbumPic to AlwaysLoadEmbedAlbumPic; it's only useful when a folder contains a mix of songs from different albums.- the album pic & song info are now cached (under each folder as folder.jpg, s2p1.tag & s2p2.tag), i.e. the second time you visit the same album, it'll be faster. - added support to HTC Diamond - both GSensor & AVRCP; for AVRCP, read the FAQs below for the detail trick. - won't keep the system alive when it's paused. - fixed the issue that all memory was ate up for some problematic embedded album pic. 앨범 아트가 지원되는 음악 플레이어가 있었네요.